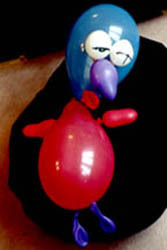 I first had my inspiration to become a balloon artist at a work's xmas do. It had been a great party with a fantastic atmosphere and there was lots of drinking, singing and fun had by all. I must confess to being a little bit tipsy myself, and with all the noise and daftness going on I was beginning to feel dizzy. With my head spinning, I sat down beside the large glittering xmas tree. Taking my rest I watched my friends. It was totally crazy. Mr Edwards the manager was doing his Ali G impression, Dave Rees was jumping from table to table, and Sandra the secretary was giving everyone her 'special' xmas kiss. Watching this zany chaos, I was suddenly hit with a flash of inspiration. What if it was I having this effect on everyone, and giving them so much fun? Then by pure chance, I saw a little box of balloons lying beneath the tree and quickly decided to make something out of them. After some intense blowing I had created a number of funny shapes and had my friends and work mates rolling around with even more laughter. My balloon show had caused quite a stir and friends were still talking about it weeks after the holidays, and well into the new year! From then on all I could think of were balloons, and dreaming of ways I could make a living working with them, and of course making people happy. I really wanted to develop a stage act but couldn't see a way forward. I didn't have any contacts or know anyone who could advise me. To be honest I became a bit depressed, and thought about giving up my dream. Then by sheer luck, fate dealt me a lucky hand. Some months later I was down at my local pub playing in a darts match. The opposition——The Ponty Flyers——were top of the league, and had some top darters in their team. They were an impressive bunch. One of these arrows experts happened to be none other than Bryn Williams, the theatrical and variety agent. He threw some marvelous darts that night, and after congratulating him on his high scores, the conversation moved onto other subjects. Bryn soon told me all about his agency and his big plans for the future. Amazingly he offered me a break right there on the spot, and the rest is history! Within six weeks I had done my first professional balloon show, and two months later I actually appeared on television as an extra in Casualty. If it hadn't of been for that darts match I doubt if my career would actually of happened. I should add that Bryn's team did win the game and went on to win the league! 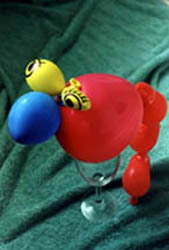 Although I'm known as a children's entertainer I also like to think of myself of my balloon artist. 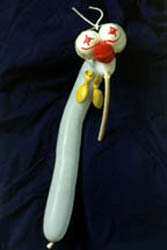 I make sculptures using balloons, and many of these pieces convey serious messages. One day I would like to have my work exhibited in an art gallery in a big city like Cardiff or even London. 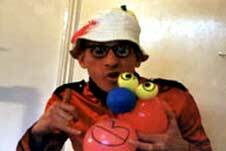 It is also an ambition of mine to appear on television doing my balloon act.